This is a unique hide ip address software hiding IP address and encoding all data to make you anonymous in the Internet. Hide IP address software will unblock any blocked website by hiding of your real IP address: Myspace, YouTube, FaceBook, Flickr and others. It's called SmartHide. 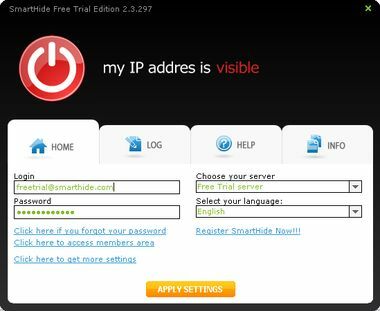 SmartHide Features: - Extremely Fast Internet; - Traffic Security. Information is encoded (E-mails and ICQ content, Online Games, P2P, banking, buying, etc. ); - Good-looking and Smart Interface. Click "Make me Invisible" to hide IP address; - Qualitative and Fast 24/7 Support Team. Hide IP address Software Bookmarks: "Log" - to follow SmartHide activity; "Settings" - to set the program to one's preferance; "Help" - to get a help to hide ip address fast; "News" - to follow SmartHide last news to hide IP address being fully protected. SmartHide shields all deals in the Internet including the filling of forms, the typing of passwords and other things that can be stolen or intercepted. That's why it is very important to hide IP address. Anonymous Surfing is just a click away!